Seventeenth century painting of Afonso IV. Afonso IV (IPA pron. [ɐ'fõsu]) (February 8, 1291 – May 28, 1357), called the Brave (Portuguese: o Bravo), was the seventh from 1325 until his death. He was the only legitimate son of Dinis of Portugal by his wife Elizabeth of Aragon. As king, Afonso IV is remembered as a soldier and a valiant general, hence the nickname, the Brave. But perhaps his most important contribution was the importance he gave to the Portuguese navy. Afonso IV granted public funding to raise a proper commercial fleet and ordered the first maritime explorations. The Canary Islands (today a part of Spain) were discovered during his reign. Afonso, born in Lisbon, was his father's only legitimate son and the rightful heir to the Portuguese throne. However, he was not, according to several sources, Dinis' favorite son; his half-brother, the illegitimate Afonso Sanches, enjoyed full royal favor. From early in life, the notorious rivalry led to several outbreaks of civil war. On January 7, 1325, Afonso's father died and he became king, taking full revenge on his brother. His rival was sentenced to exile in Castile, and stripped of all the lands and fiefdoms donated by their common father. Afonso Sanches, however, did not sit still. From Castile, he orchestrated a series of attempts to usurp the crown for himself. After a few failed attempts at invasion, both brothers signed a peace treaty, arranged by the Afonso's mother Queen Elizabeth. In 1309, Afonso IV married Infanta Beatrice of Castile, daughter of King Sancho IV of Castile by his wife Maria de Molina. The first-born of this union, Infanta Maria of Portugal, married King Alfonso XI of Castile in 1328, at the same time that Afonso IV's heir, Peter I of Portugal, was promised to another Castilian infanta, Constance of Penafiel. These arrangements were imperiled by the ill will of Alfonso XI of Castile, who was, at the time, publicly mistreating his wife. Afonso IV was not happy to see his daughter abused, and started a war against Castile. Peace arrived four years later, with the intervention of Infanta Maria herself. A peace treaty was signed in Seville in 1339 and, in the next year, Portuguese troops played an important role in the victory of the Battle of Rio Salado over the Marinid Moors in October 1340. The last part of Afonso IV's reign is marked not by open warfare against Castile, but by political intrigue. 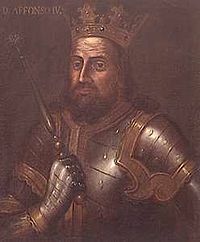 Civil war between King Pedro of Castile and his half-brother Henry of Trastamara led to the exile of many Castilian nobles to Portugal. These immigrants immediately created a faction among the Portuguese court, aiming at privileges and power that, somehow, could compensate what they lost at home. The faction grew in power, especially after Ines de Castro, daughter of an important nobleman and maid of the Crown Princess Constance, became the lover of her lady's husband: Peter, the heir of Portugal. Afonso IV was displeased with his son's choice of lovers, and hoped that the relationship would be a futile one. Unfortunately for internal politics, it was not. Peter was openly in love with Ines, recognized all the children she bore, and, worst of all, favored the Castilians that surrounded her. Moreover, after his wife's death in 1349, Peter refused the idea of marrying anyone other than Ines herself. The situation became worse as the years passed and the aging Afonso lost control over his court. Peter's only male heir, future king Fernando of Portugal, was a sickly child, while the illegitimate children sired with Ines thrived. Worried about his legitimate grandson's life, and the growing power of Castile within Portugal's borders, Afonso ordered the murder of Ines de Castro in 1355. He expected his son to give in, but the heir was not able to forgive him for the act. Enraged at the barbaric act, Peter put himself at the head of an army and devastated the country between the Douro and the Minho rivers before he was reconciled to his father in early 1357. Afonso died almost immediately after, in Lisbon in May. Afonso married Beatrice of Castile (1293-1359) in 1309, daughter of Sancho IV, King of Castile, and Maria de Molia, and had four sons and three daughters. Infanta Maria 1313 1357 Queen of Castile by marriage to Alfonso XI of Castile. Infante Pedro April 8 1320 January 18 1367 Succeeded him as Peter I, eighth King of Portugal. Infanta Leonor (Eleanor) 1328 1348 Queen of Aragon by marriage to Peter IV, King of Aragon. Maria Afonso 1316 1384 Natural daughter.